Larry Taylor, a partner at Beau Townsend Ford, was the first recipient of the Vandalia-Butler City Schools Business Partner Award. He is pictured with Superintendent Rob O’Leary as well as many of the district’s administrators. 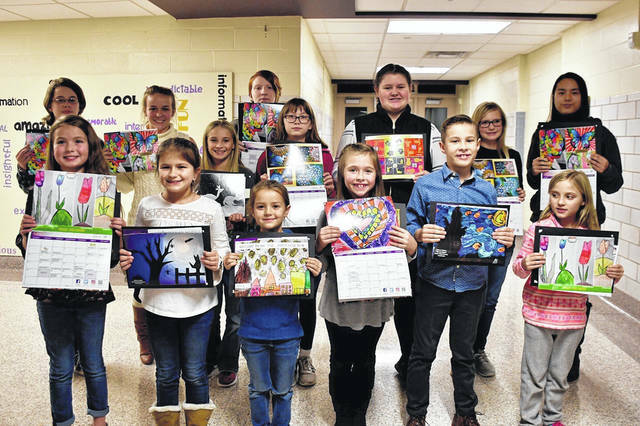 Student artists whose art was featured on the district’s 2018-19 calendar were recognized by the Vandalia-Butler Board of Education on Tuesday evening. VANDALIA — There’s very few things in Vandalia that Larry Taylor hasn’t had a hand in. On Tuesday, Taylor, a partner at Beau Townsend Ford, was awarded the first Business Partner Award by the Vandalia-Butler City Schools. The award, created in response to the district’s strategic plan, is intended to identify and acknowledge key businesses and partners of the school district. Superintendent Rob O’Leary said Taylor was honored for his long-standing support of the district both financially and by service on various committees. In addition to Taylor, student artists were honored for their work that was chosen for the district’s 2018-19 calendar. Those students were: Ava Alvarado, Allison Baker, Isabella Bratton, Trent Butler, Cecelia Campbell, Lauren Davis, Lariah Dziekan, Alexis Forsythe, Victoria Greaver, Angel Guo, Ashlyn Haywood, Courtney Kessler, Paige Kessler, Mackenzie Kohlrieser, Alexandra Kreitzer, Reese Landis, Kailyn Larger, Jalyn Love, Abbigail Lucas, Ty McClain, Bria Neale, Lily Pederson, Jolene Powers, Jessica Sacks, Marlie Snyder, Sophia Solorio, Eva Stalter, Nora Stammen, Caily Stidham, Leia Unger, Konner Vandervort, Kaisen Vicars, Zheying Wei, and Megan Zins. In business items, the board approved donations of $500 each from the Vandalia Senior Center to the Butler National Honor Society and the Butler drama department. The board also approved a $1,000 donation from Walmart to Helke Elementary School towards its playground. The board approved a media collection for Smith Middle School by a 4-1 vote. Board Member Mary Kilsheimer voted no. There was also disagreement among the board about course options for Butler High School in the 2019-20 school year as well as potential Project Lead the Way (PLTW) courses. PLTW includes hands-on learning experiences in computer science, engineering, and biomedical science. Initially Board Member Kent Zimmerman and Kilsheimer argued for implementation of the new course options but delay in the potential PLTW courses beyond 2020 until more detail was provided and a presentation to the board. That motion was defeated 3-2 with Board Member Missy Pruszynski, Vice President Holly Herbst, and President Rodney Washburn voting no. Herbst then moved to approve the course recommendations as presented by O’Leary which was seconded by Pruszynski. That motion carried 4-0 with Zimmerman abstaining. The board also approved several personnel items as well as a consulting agreement with SHP for community engagement in educational visioning and master facility planning. The cost of the contract is $48,000 with $32,000 due as a lump sum payment.